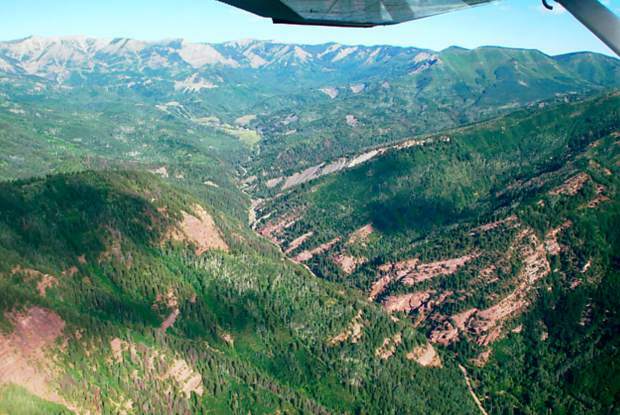 The file shot shows an aeria view of the Coal Basin area west of Redstone. Coal Basin was removed this month from lands available in the White River National Forest for oil and gas leasing. The U.S. Forest Service put recreation, ranching, hunting and fishing on equal footing with commodity production earlier this month when it reduced land available for oil and gas drilling in the sprawling White River National Forest. An updated plan reduces the amount of land available for leasing from 417,000 to 194,123 acres. A final environmental impact statement said a reasonable assumption about long-term drilling potential foresaw 903 to 1,014 oil and gas wells from 179 pads under the new rules. The approved plan reduces the number of new wells that could reasonably be expected to a maximum of 487 from 86 pads. “Laws are set up to say, ‘You will allow the production of the resources,’” Fitzwilliams said. But he determined that oil and gas drilling — even under tight regulation — could result in too great of a change of character to some lands. The large block of roadless areas, for example, would be altered by the construction of roads and infrastructure, Fitzwilliams said. The 2.2 million acre White River National Forest surrounds the resort areas of Aspen, Vail, Summit County and Glenwood Springs. It stretches west of Rifle, where hunting is a major economic engine. While skiers in Aspen and Vail weren’t going to be affected by oil and gas leases, even under the old rules, many forest visitors want the natural character of the broader forest to remain intact, Fitzwilliams said. There are 12 million annual visits to the White River National Forest, the highest amount to any public land unit, according to Fitzwilliams. The new oil and gas rules will be in place for the next 15 to 20 years. Fitzwilliams’ decision is significant because the oil and gas industry wasn’t handed a “trump card” like it’s usually given, said Peter Hart, an attorney with the Carbondale-based environmental watchdog group Wilderness Workshop. Public-land management agencies often favor oil and gas development over recreation, hunting, fishing, wildlife protection and preservation of watersheds, he said. “Hopefully, this is an indication of a trend — that moving forward we’re going to see something more thoughtful,” Hart said. When the new oil and gas plan was unveiled Dec. 9, most of the scrutiny from Roaring Fork Valley observers was on the decision to remove 61,000 acres with high potential of oil and gas resources from leasable lands. Hart said Tuesday the plan is also significant for adding clarity to leasing of roadless lands and instituting resource protection on them. Roadless areas can only be leased with the requirement of no surface occupancy. That means gas companies would have to drill wells directionally from outside the roadless lands. However, Wilderness Workshop also believes the plan must be put into perspective. Five field offices that oversee Bureau of Land Management property in Northwest Colorado have completed or are completing their oil and gas master plans. Collectively, they contemplate drilling of about 26,000 oil and gas wells in that corner of the state over the next 20 years. That is 50 percent of all active wells currently in the state. “When you start talking about reducing the number of wells in the White River National Forest, it’s a drop in the bucket, really,” Hart said.